Harrison Assessments award winning solutions exceed the results of other talent management methods and personality tests by aligning people's qualifications and passions with company-specific jobs. Our unique Paradox Technology identifies employees and applicants who are three times more likely to achieve business results. Save up to 70% administration time with our talent acquisition and succession planning solutions. Engage and retain top talent and build high performing teams with our unique employee development and employee engagement tools. Try for free now. Our talent management solutions align people's qualifications, wants, needs, passions and goals to the requirements of the organization and specific jobs. This innovative approach exceeds general personality testing and other methods because it measures 175 factors, resulting in reports that target job-specific employee engagement, success, and retention. Automate internal and external talent pools with advanced technology.Empower managers with easy to understand reports.Easily customize for your jobs with our library of 6500+ Job Success Formulas.Develop leadership and teamwork.Customize to match your behavioral competencies.Strong validity and legal compliance without adverse impact. 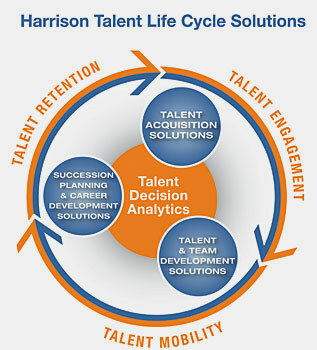 "Talent Intelligence is an Authorized Solution Consultant of Harrison Assessments"